Olivia is a 3 year old pig with 3 legs as one front leg was amputated when she was about 4 weeks old due to a fracture. 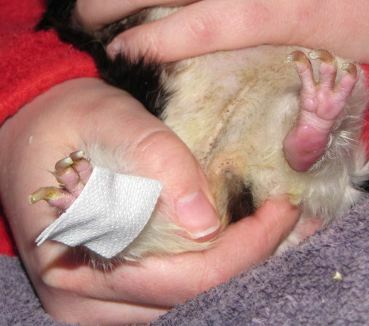 Olivia had a triple bumblefoot, so the vet put her on a diet (no pellets) and had her on Cipro and Meloxicam for 3 weeks. 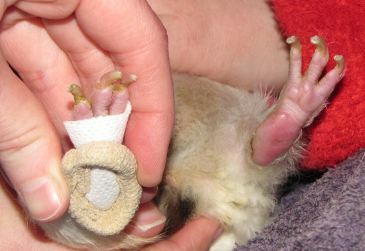 She was also put on restricted movement with foam padding underneath her regular bedding to take pressure off the feet. The front foot appears to have healed (1 month later) fairly well but the back feet still look bad. 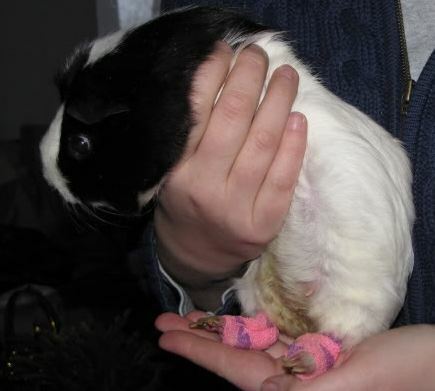 The vet has made little booties for her. 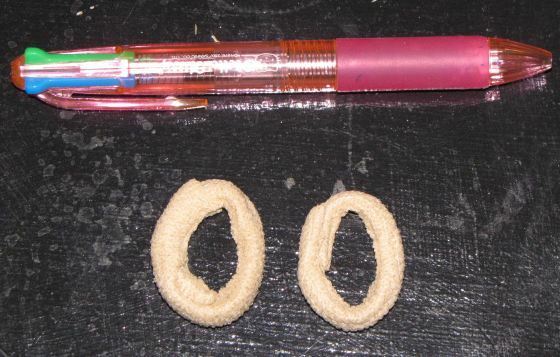 There is a donut that goes around the outside bottom of the foot to relieve the pressure off the center of the foot. Then a small gauze pad with derma gel. Finally this is wrapped with vet wrap to create the bootie. These are to be changed every 1-3 days depending on how the bootie look. I have taken photos but am currently unable to upload them. I'll upload as soon as possible. I really hope the booties help her heal. I hope they help. 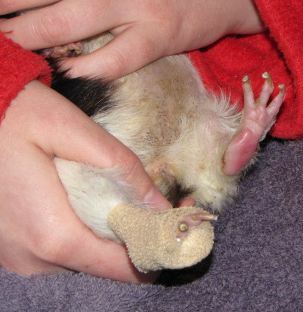 Bumblefoot can be difficult to manage. Poor Olivia. I hope she fets better soon. Sending good thoughts for Olivia, and I hope the custom-made booties help her to heal. Poor Olivia! I have no experience with bumblefoot, so I can't offer any advice. I hope the booties make her more comfortable. The booties have helped her feet immensely. The swelling went down immediately. Saltwater soaks helped remove the old, dead skin and scabs. The bad problem with the booties is that if she lay down on her side, she could not get back up. She has lost some weight from this. The vet said to continue antibiotics and antiinflammatory meds, but discontinue the booties for now. She recommended foam padding now that is not solid, but pieces of foam so that she will sink in and have much less pressure on her feet. Vet also wanted to do penicillin injections. She said when she looked this up, it said absolutely to not give to guineas, but did not say why. She wanted to go the injection rout because it could be weekly and would also not stress the GI tract like oral antibiotics. Photos aren't the best, but you get the idea. Poor girl! It does look like there has been significant improvement. I take it you are/will be slowly nibbling away at those toenails? Some of her problem moving around might be from the length. Your pics are great. Let me know if you'd like me to add them to this thread. Aww the poor baby! Bless her little heart. After a week long course of lasix (along with his permanant lotensin) we finally made great head way with his feet. They are completely healed! I of course am constantly on guard and look at his feet every day. if I see the puffy reddening start developing, I know he need a round of lasix, kept of soft fleece and aloe on his feet then he is fine again. I agree with Lynx concerning her nails. 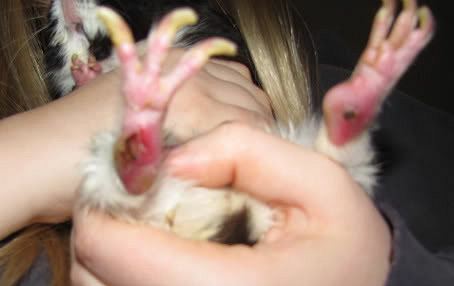 Jimmy had really bad nails when I first took him in and it made him not able to wAlk right. It was quite painful for him. Also I see her bottom is wet and stained with urine. Please do your best to gently wasH her there frequently so she doesn't wind up with painful sores from urine scald or bladder infections from sitting in pee. As far as the urine goes, she gets salt soaked once daily and everything gets washed away. Perhaps we should up it to twice? You're right about the nails! I tend to cut all my animals a bit long cause I'm afraid of hitting the quick. 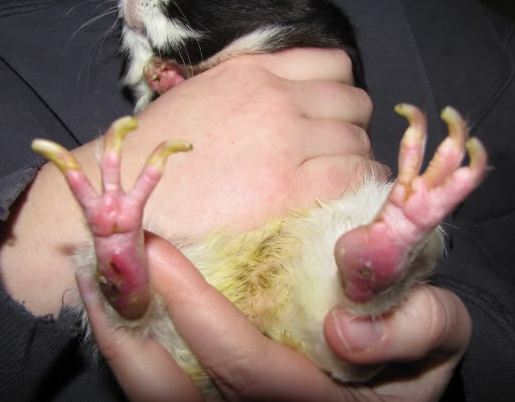 Her nails also had an extra layer grow around them w/the bumble foot, which made it even harder to see. I will have my SO clip them as she doesn't have the same reservations I do! Thanks for the heads up about the heart probs. The vet is pretty sure it's because she only has three legs, but it's definitely worth looking into. How do they check the heart? They can do an xray to se if it is enlarged or if their is fluid around it or in the lungs. You can't always hear fluid even with a stethascope. When I took my one boy in the vet said his chest sounded clear but the xrays made it very clear that he as in desprate need of lasix and lotensin. Unfortunately not all vets (even cavy vets) are real good at dealing with heart issues. Some still even refuse to acknowledge it is a very common problem for them. I have encountered one of the vets that didn't know any better when my favorite was unavailable. He was looking at a very enlarged heart with fluid around it then told me the heart was perfectly fine! Thank God at that point I knew exactly what I was seeing and have lotensin and lasix on hand and the ability to get more with just a phone call so I began treatment for him immediatey too. There are pictures on this site somewhere that show you x-rays of a normal sized heart and an enlarged one. I can't recall where but I know I saw them here. I can't remember if there are pictures that show you how to tell if their is fluid around the heart or not but I can tell you that my pigs that showed fluid had a hazy/fuzziness surrounding the heart and the vet confirmed that what I was seeing was indeed the fluid. Perhaps we can find them and you can print them and take them with you to the vet? My first heart pig we even did EKG's on and re-xrayed her six months after starting treatment. The lotensin work wonders for stopping the enlargment as it got no larger and the xray showed a much more crisp looking heart with no hazing aorund it at all from the lasix treatment to get all the fluid out of her. Her EKG stablized and the second one showed her heart was acting just like a perfectly healthy one to my great relief and joy. EKG's are not necessary to find or treat heart disease but my Lovebug was the first pig my vet had ever tried to treat for heart disease so we wanted to try to gather as much information as possible for future reference. She is wonderful about researching and being willing to listen and try things if I ask we at least try. I would definately be washing her more frequently than one time daily since she has such moblilty issues. Think of it this way. If the urine had enough time to stain her hair it has enough time to make her sore on the outside or worse give her an infection on the inside. With her nails you need to just clip some of the tip then wait a few days then clip a bit more and so on. This gives the quick time to retract before you clip more so you don't cut into the blood supply. Once you get them all the way back to the right size it will be easy to keep them that way. Blah, I ended up clipping her nails and got a single bead of blood from 3 or 4 toes, though she didn't react. I must have let the quick get long. Will keep a better eye on it. Partner bought shredded foam to bed her on. She got it from JoAnn's. Put it in a garbage bag, then put whelping pad on top and fleece on top of that. It has helped a TON! No more booties hopefully. Will post more pics on the weekend to document her progress. Can you take photos of what the booties look like before they are wrapped on? Olivia was getting much much better after bedding her on the shredded foam. She was able to go off the medication. We took the cage partition down and moved her back in with the other girls. The cage now has two litter boxes with carefresh on either end and the whole middle is shredded foam with a whelping pad on top and fleece on top of that. 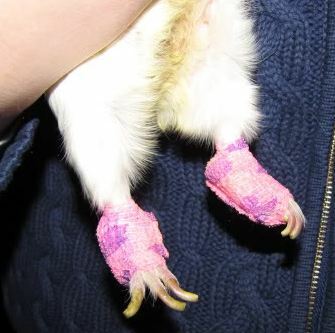 After moving her back in with the other girls, her feet looked a bit worse, so we started her back on the anti-inflammatory. We think we may have to bandage her feet once a week or so for 1-3 days, but we'll see. And the much delayed bootie photos! 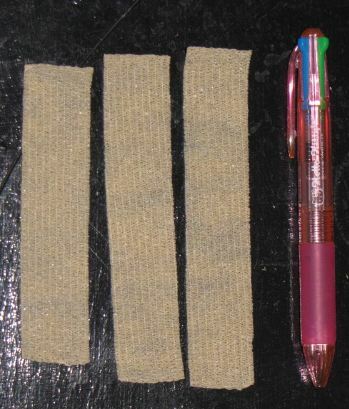 1 Self adhesive gauze roll (or vetwrap). 1 gauze pad cut to size. Cut 3 strips of gauze wrap and lay them on top of each other. 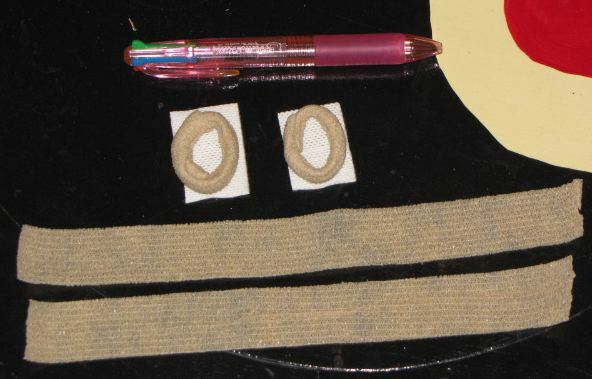 This is the approximate length the triple piece should be to make one circle. Once you have the triple piece, roll it up hotdog style to form a tiny, but very long cylinder. Then make a circle out of it. Repeat so you have one for each foot. Lay your pieces at the ready! Put a tiny dollop of dermagel on the cut gauze pad. Place the dermagel area on the bumble. The bumble should be in the middle of the ring, so no pressure is on it. Use the self adhesive gauze wrap to wrap the circle and gauze pad onto the foot. Be CERTAIN to leave the toes out of the bandage and check frequently to make sure the toes aren't swollen (circulation being restricted). If toes are swollen, you will need to rewrap. We also had a rubbing sore on the top of the foot so we added some gauze pad on top and everything was fine! Great pics! Interestingly, I always thought it was best to wrap the entire foot with the toes inside. I thought that was how Pinta did it too. Looks like you are protecting the foot quite well. 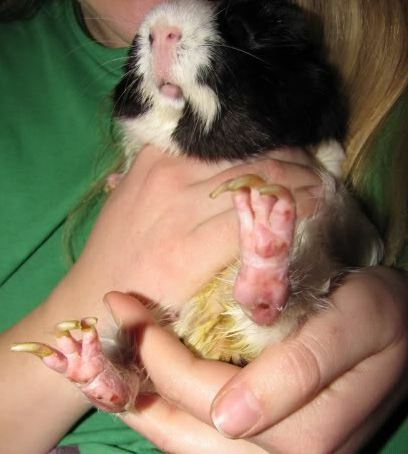 Well, if you leave the toes out, you have a visual indicator of circulation in the foot. 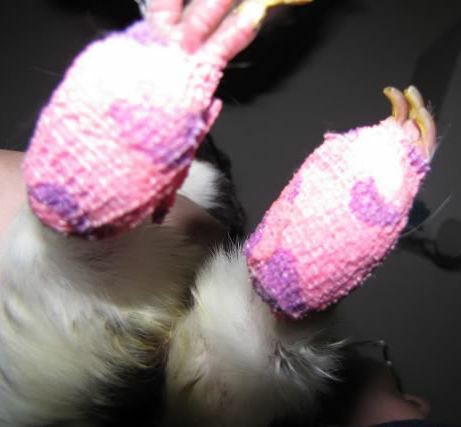 But wrapping them up would probably be good for bad cases of mites or other times you wouldn't want them to be able to scratch. I'm glad her feet are getting better. The booties look pretty cute on her. unicornvr, let me know if you'd like me to add your pics permanently to the thread. Lynx - I think that would be a good idea. I can't believe the immediate improvement we saw with the booties. Hopefully they can help others out facing the same dilemma. I think it's best to leave the toes out in this case, because it can be hard to gauge how tightly to wrap the circle/donut on the foot. The vet said wrap a bit more loosely over the top of the foot and a bit more tightly round the donut. We went through a couple days of readjustments when the toes looked swollen before we got it just right! I would also highly recommend having two people for this. One to hold and one to wrap.